The Unlikely Boat Builder: Oil or Varnish? Of all the sails on a traditionally rigged cutter, the jib -- the sail set at the end of the bowsprit -- is the most ornery. Unlike the foresail, which is hanked on to the forestay and thus kept under close control, the jib is 'set flying' -- i.e. its tack is hauled out to the end of the bowsprit while its head its hoisted to the masthead. 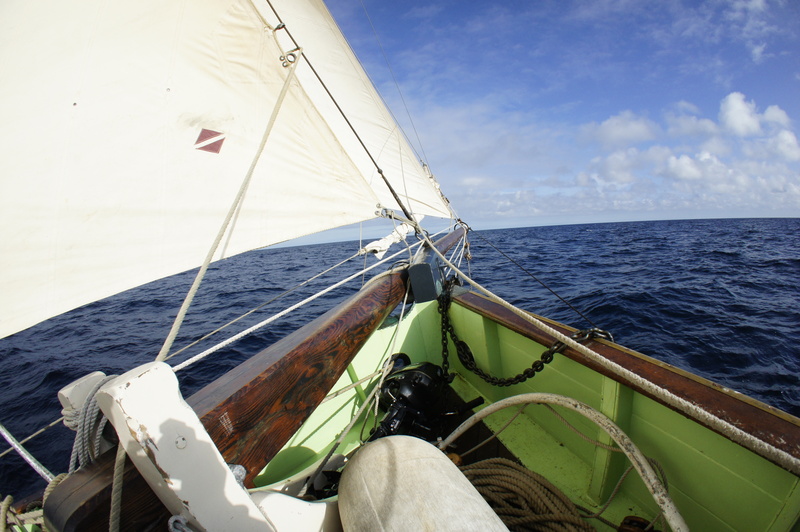 A wire sewn into the luff of the sail prevents the wind from tearing it in half. The jib on the Blue Moon has always been easy to set: just tie on the lines and haul away smartly before the wind can blow it away. Striking the jib, on the other hand, was like wrestling with a angry tiger: pulling like anything, thrashing away at anything within reach, always looking to jump overboard, and you with it. I got better at handling it, over the years, but every once in awhile I'd wait too long to take it in, and there'd be too much wind, and the damn thing would try to kill me. I thought about putting it on a roller-furler, but then I went sailing on Agnes and saw how things were managed on a properly rigged boat. 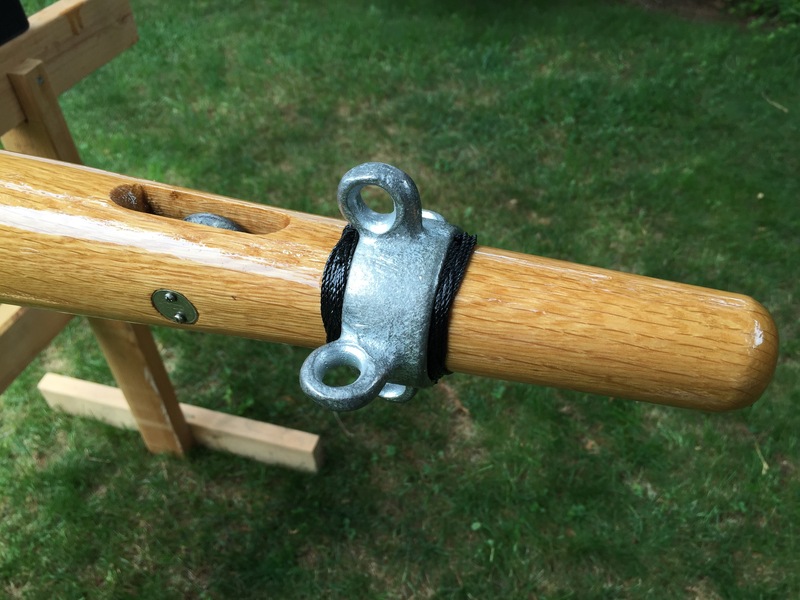 The tack of Agnes's jib was attached to a bowsprit traveler which could be hauled in or out along the sprit. This kept the tack under control at all times, and made setting the much larger jib on Agnes a simple affair. 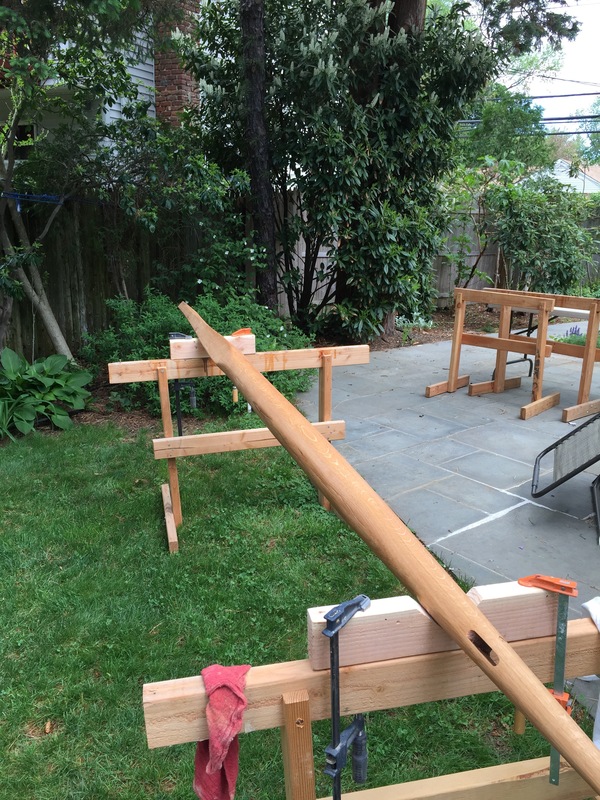 I'd never seen a bowsprit traveler in my life -- or ever heard of one before -- but as soon as I saw it in action, I thought, right... that's for me! Finding one, on the other hand, is not so simple. Even at the better chandleries in New England, such things had been removed from the shelves at the same time they stopped carrying mast hoops and kranze irons. And speaking of kranze irons, I needed one of them, too. I found a foundry in the Puget Sound region that claimed it could fabricate both a traveler and kranze iron for me, in bronze, in just the sizes I needed. No problem! I will not name this well-known company, but suffice to say I wasted most of the winter waiting for them to 'get around to it'. They never did. Desperate, I finally ordered both from Classic Marine in the UK. These are not off-the-shelf items even for them, but they did manage to fabricate and deliver them on time. Phew. Highly recommended. I'd love to visit them sometime. Here's what a traveler looks like. 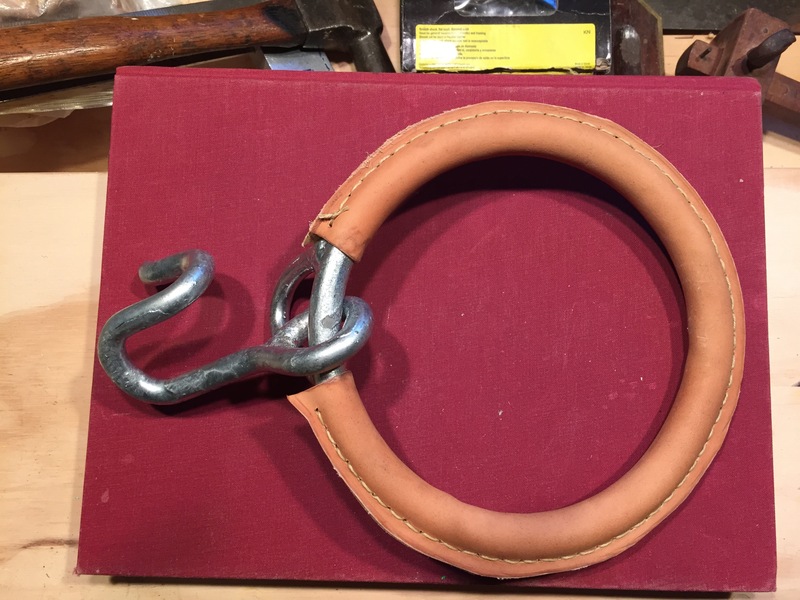 The pig tail hook is the traditional shape. You can hook the tack of the sail on to it and it will stay attached. No fumbling with shackles. This one is about 4-inches inside diameter, which is just big enough to fit around the bowsprit, when the traveler is hauled in. Rather than running the outhaul line through a block at the end of the bowsprit, I thought I would let a sheave into the end of the bowsprit. Much neater, I think. 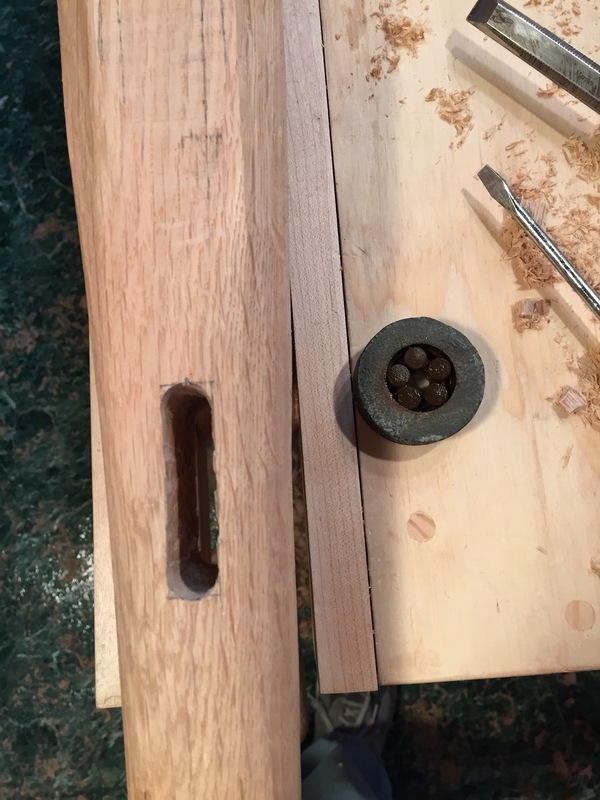 While the bowsprit was still 8-sided and could be clamped firmly to the bench, I cut the mortice for the sheave and drilled a hole for the pin. The grotty-looking sheave, by the way, I removed from one of the Blue Moon's original wooden blocks. The block body was falling apart, but the galvanized sheave with bronze rollers still had plenty of life left in it. I cleaned it with kerosene and greased it up good before installing it. Bet it's still spinning out there 20 years from now. Then it was time to 16-side the sprit. I did that fairly quickly with a spokeshave. It's actually hard to tell from the picture below that it's 16-sided and not round. From this stage, it's pretty easy to get it completely round with a few strokes of the spokeshave. Then it was time to face the big question: Varnish or oil? 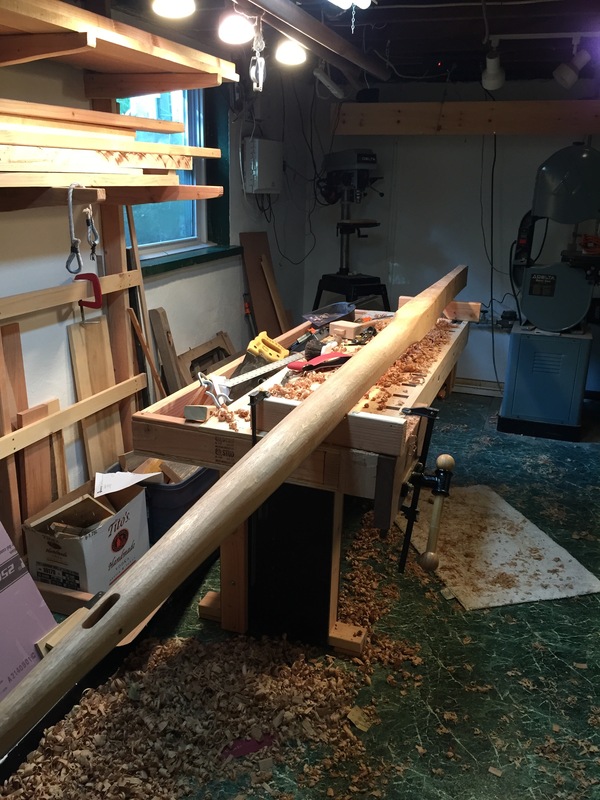 Luke had finished his bowsprit with deck oil. Not the deck-of-a-ship oil, just plain old backyard-patio-deck oil. Agnes's sprit looked beautiful to me, and John and Captain Flint finished Swallow's new mast with oil in Swallowdale, so for most of the winter, I was pretty set on oiling the Blue Moon's new bowsprit. But neither the sun nor the winters in England are as harsh as they are here in New York, and I really did not think oil would give good enough protection. And besides, there really isn't enough varnished wood in the world these days, so in the end, I decided to varnish the sprit to match the Blue Moon's boomkin. So, with spring fitfully springing, I hauled the sprit out to the backyard and started applying a coat of varnish per day, at least on days it didn't rain. Meanwhile, I got the crazy idea that I should dress up my new kranze iron with turks heads on either side. I'd never tied one before, so whiled away the time between coats of varnish by practicing. 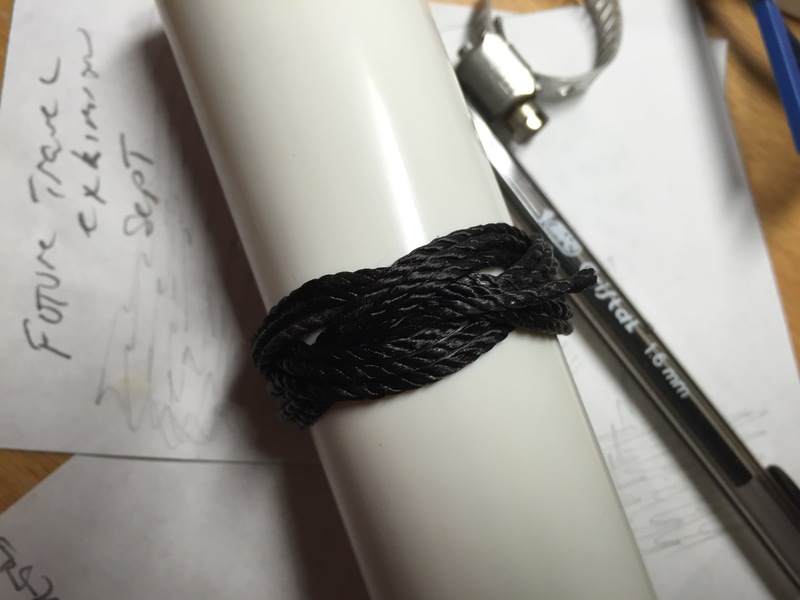 It's pretty tricky to tie a turks head with light line, but I eventually got the hang of it. So here is the finished end of the bowsprit, with sheave installed (Canadian 'schooner' dimes covering the pin holes), and kranze iron in position with matching turks heads, varnished solid. That's 2-inches of solid white oak at the end. Much stronger than the 2 inches of Douglas Fir it replaced. Do not get in my way! With the varnishing complete, there was nothing left to do but to install it. I sure hoped it was the right length for my whisker stays, but there was only one way to find out. Love the "Do not get in my way comment". Also, I really enjoy following what you are doing. Beautiful work.